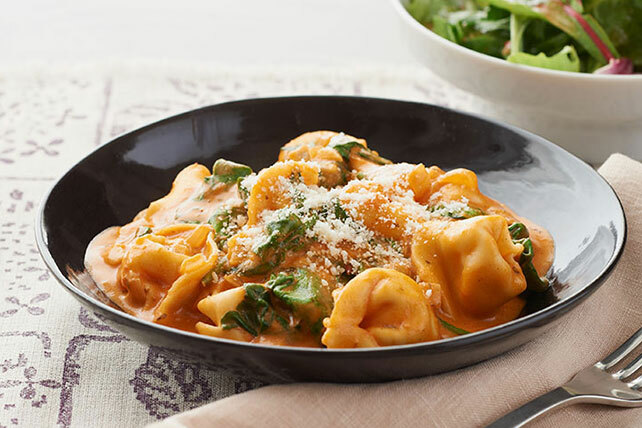 Made with refrigerated cheese tortellini and a blend of broth and spaghetti sauce, this creamy pasta dish only takes 35 minutes start to finish. Mix cream cheese spread and milk until blended. Heat oil in large skillet on medium heat. Add onions and garlic; cook and stir 5 min. or until onions are crisp-tender. Stir in broth and pasta sauce. Bring to boil. Add pasta; stir. Cover; cook on medium heat 5 min., stirring occasionally. Add cream cheese mixture; cook and stir 3 to 5 min. or until heated through. Cover; cook 5 min. or until pasta is tender, stirring occasionally. Stir in spinach; cook, covered, 1 min. or just until wilted. Top with Parmesan. Serve with hot steamed fresh green beans, or a mixed green salad tossed with your favorite KRAFT Dressing.